An enchanting private cottage, ideal for two. 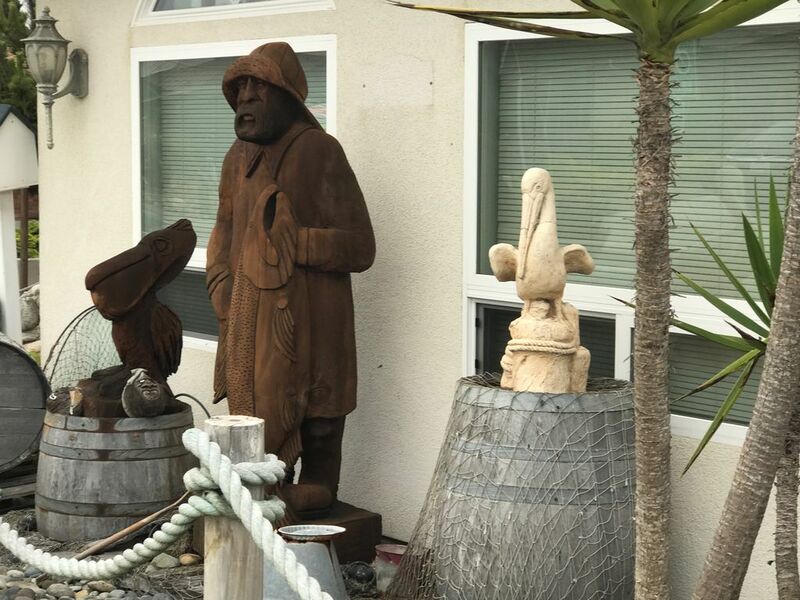 Steps from the sand, whale spouts, sand dollars and sea otters to greet you. Private entrance, King size bed, fireplace and private bath. Outdoor seating area to enjoy ocean sunset views. Small refrigerator, microwave and place settings to make your stay easy and comfortable. Outdoor storage for beach toys, if you would like to bring them. Private washer and dryer. You are surrounded by fabulous scenery and places to visit, whether walking, biking, kayaking, paddle-boarding or hiking. Morro Bay's Embarcadero is a relaxed walk from the cottage. For further jaunts, you can get in your car with easy access to major Central Coast attractions, such as the famous Hearst Castle, Paso Robles wine country, Cayucos pier, Cambria's moonstone boardwalk and Montana de Oro. Cal Poly San Luis Obispo is only 15 minutes by car, so parents can visit children at school and escape back to the coast easily. We do not allow smoking, children or pets. We welcome your visit and will be happy to share our little piece of paradise with you! We are David and Sabine Zepp, long-time Central Coast residents. We want to share the amazing Central Coast with you. We are well-versed in local attractions. If have questions we are happy to assist you. Location, location, location. Steps from the beach with so much natural beauty to enjoy. The cottage allows access to activities as well as peace and relaxation. The views of the pacific and centralized location allow us to enjoy all the aspects of the Central Coast we adore. Small indoor table for two, large outdoor table for six. Captain Java’s Cottage was our home away from home from 4/14 till 4/20 2019, and we were happy here. The cottage/studio is clean, comfortable and cosy. The bed and shower are fantastic! The neighborhood is nice and quiet. We enjoyed being in Morro Bay. As nature lovers we especially liked Moro Rock, Morro Rock State Park, Moro State Sweet Springs, Elfin Forest Preserve and Montaña de Oro State Park. And of course, further north, the Elephant Seals! Our favorite lunch place: Celia’s Garden Café in Los Osos! David and Sabine pay attention to every detail. It is such a wonderful use of space. So clean and comfortable. The view and sounds of the ocean when you walk out is priceless. Highly recommend if you are coming to the area. We came for the Cal Poly open house. Very easy drive to the campus. Location for morro beach and cambria. Great spot for relaxing and rejuvenation. Perfect location, hosts provide many amenities! We had a wonderful weekend. Everything was very clean and welcoming. Enjoyed the amenities provided including a bottle of champagne! Ocean view, beautiful location, short walk to the beach. Comfortable and close to downtown.